← How can I create high quality SGI from Word documents? How to make PDF E-Book? Maybe we are not unacquainted to E-Book form. It is an electronic book which is publish in digital form, consisting of text, images, or both, and produced on, published through, and readable on computers or other electronic devices. E-books are usually read on dedicated hardware devices known as E-Readers or E-book devices. Personal computers and some mobile phones can also be used to read E-books. In most situations, we download E-book form the website then have you wondered that how to make an E-Book yourself? Actually, making PDF is not so hard as you think. 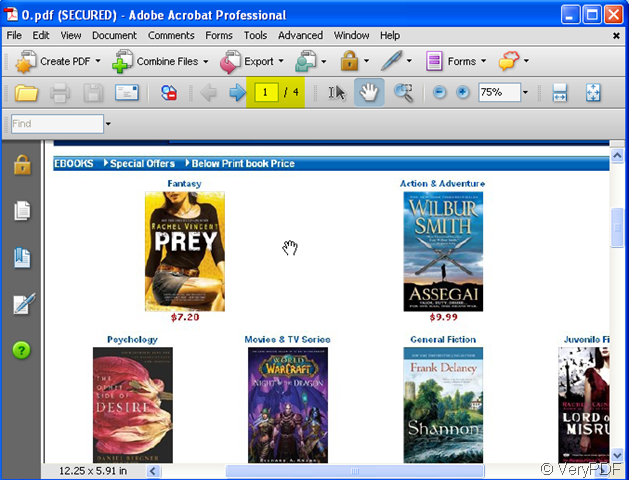 Numerous E-book formats emerged and Adobe with its PDF format is one of them. It is known that only we can convert the file to PDF file then we can make it to E-Book form. If you have installed Adobe in your PC, it will be easy for you. But if you do not have installed Adobe, how could you handle it? I introduce a software to you, hoping it will be helpful. It is Image2PDF whose nickname is PDF E-Book Maker. By Image2PDF, you can directly convert dozens of image formats, such as TIF, TIFF, JPG, JPEG, GIF, PNG, BMP, PSD, WMF, EMF, PCX, PIC and so on, into PDF format. Convert your files to image format. Say your file is a paper document, you can scan it or take a picture for it then store the file image in PC. If your file can be shown in PC then you can make screenshots of it. Add your file images to Image2PDF . I will take some images for example. 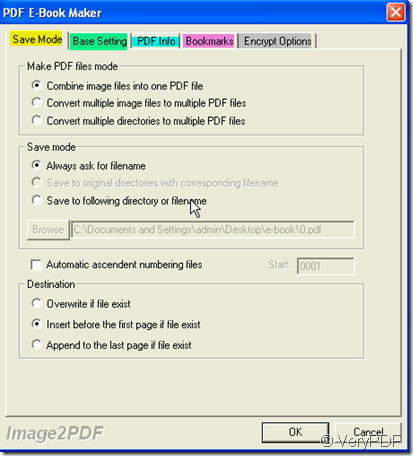 Then choose the restrictive conditions for your PDF files by clicking “Setting”. 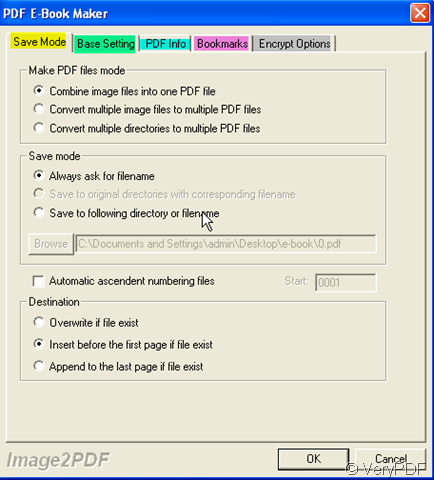 Say if you want to combine all your images files into one PDF file , you can set it at “Save Mode” label. If you want to set a password for the newly produced PDF file, please set it at “Encrypt Option” label. There are still many option labels here, such as “Basing Setting”, “PDF Info” and “Bookmarks”.if you have finished the setting, please click “OK” to end it. The last step is to click the “Making PDF” to finish the converting. The PDF file will be shown automatically. You can store this kind of file to your cell phone or PC as you wish. It is very convenient for taking and reading. How to convert URL to bmp? How to read text in a rectangle from PDF file? Can you show me a method to convert RTF to GIF? How to convert Webpage to PBM? Who can help me convert a JPEG file to PDF format? How to set the document title, subject, author and keywords then add it to my PDF file? who can help me convert a JPEG file to PDF format by command line? How to make searchable E-book? I need a pdf to pdf OCR converter (command line), can you help me?